Support the Rights of all Women and Girls by Voting Yes on 3 » Mass NOW INC.
Women’s and girls’ rights are on the ballot this Tuesday, November 6th and it is critical that we hold our ground. 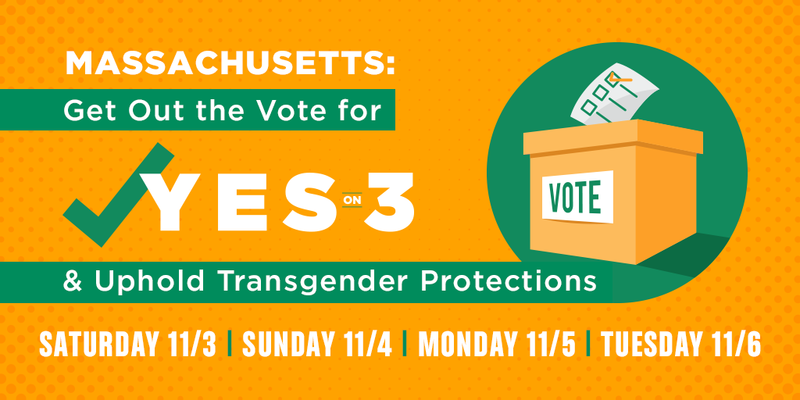 Ballot Question 3 will maintain current law that protects the health and safety of transgender girls and women in the Commonwealth by outlawing discrimination in places of public accommodation. Opponents to Yes on 3 are trying to remove current protections by promoting a false and disproven opposition between the safety of non-transgender and transgender women. The truth is, maintaining our current law protects the rights and safety of all women and girls. We know that our rights and safety are tied together and that undermining the rights of any of us threatens the rights and safety of all of us. Let’s be clear, opponents to Yes on 3 want to send women and girls back to a time of rigid gender roles and sanctioned bigotry. Their agenda includes legislation to “defund” Planned Parenthood in Massachusetts and opposition to two Mass NOW priority bills: the Conversion Therapy Bill and Healthy Youth Act. Opponents to Yes on 3 are trying to send us backward in time, not forward to progress. Mass NOW urges our members to stand with us and women’s rights supporters across the Commonwealth in voting Yes on 3.